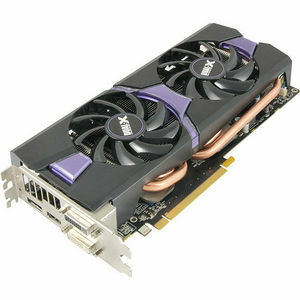 The SAPPHIRE R9 285 Dual-X is a new model from SAPPHIRE that features a new GCN core and the company's Dual-X cooler. Dual-X, with its two aerofoil fans, and set of graduated sizes of heatpipes, is an efficient and quiet cooler design which received industry acclaim in previous generations of products. The R9 285 OC model features the enhanced clock speeds of 965MHz for the core and 1400MHz for the memory (5.6GB/s effective). 4X75 Watt 6-pin PCI Express power connector is required for CrossFireX system. Blu-ray / HD DVD playback requires Blu-ray / HD DVD drive. 850 Watt Power Supply is recommended for CrossFireX System.